If you have ever taken the time to sit down and jot out a plan for starting your own business, you need to enter our Springboard Ideas Challenge. If you ever even just thought about a cool idea for a business or service, you need to enter our Springboard Ideas Challenge. You never know! YOU could win $10,000! There’s even a high school category for competition this year. Click here for more information about the competition, divisions, awards and prizes. Registration is now open for our fifth annual Springboard Ideas Challenge! Don’t worry if you don’t know how to write a business plan, there are training sessions scheduled to help you learn! Also, mark your calendars for Tuesday, April 17th for the Springboard Ideas Challenge Awards Dinner. We’re honored to welcome William (Bill) E. Greehey, former Chairman and CEO of Valero, as our guest speaker. Click here to learn more about Mr. Greehey. He now serves as Chairman of the Board for NuStar Energy L.P. and is an active philanthropic patron in the San Antonio area. We hope you can join us during this exciting Springboard season. After being pushed from the fall, due to their appearance in the World Series, we are thrilled to welcome the CFO of the Texas Rangers, Kellie Fischer, to our campus on Feb. 7th. Kellie Fischer was appointed Chief Financial Officer of the Texas Rangers in March of 2005. 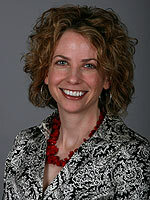 She oversees all financial matters, human resources, information technology and legal operations for the Texas Rangers. Kellie joined the Rangers in 1999 and has served in many roles for the Rangers former parent company, Southwest Sports Group and the Dallas Stars. Prior to joining the Rangers, Kellie spent four years at PricewaterhouseCoopers LLP in the audit division of the Dallas office. She earned her B.A. in accounting from Baylor University in 1995 and is a Texas CPA. Kellie serves on the Executive Board of Directors for the Arlington Chamber of Commerce, the Board of Directors for the Texas Rangers Baseball Foundation, the YMCA of Metropolitan Dallas, and the Baylor Hankamer School of Business Advisory Board. In addition, Kellie recently served on the Baylor Accounting Department Advisory Board. In October 2010, Kellie was awarded Chief Financial Officer of the year for private mid-size companies by the Dallas Business Journal. Kellie and her husband Scott reside in Dallas and are active in promoting cancer awareness for the American Cancer Society Relay for Life. The luncheon event, where Mrs. Fischer will be speaking, is free and only open to ACU students and faculty. For more information, click here. Heading overseas with COBA this summer? If you are heading to Honduras or Australia with COBA this summer, you need to be sure you have completed and returned these forms to MC Jennings in the Dean’s Suite.